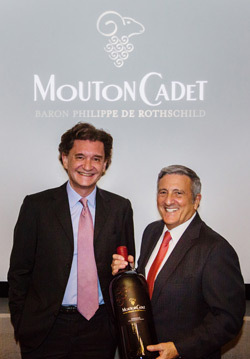 Philippe Sereys de Rothschild, Chairman and CEO of Baron Philippe de Rothschild SA, announced today the relaunch of the new Mouton Cadet portfolio in the United States marking the occasion by visiting New York, Miami, and Las Vegas to celebrate with wine trade partners and fans alike. More than sixty years after the introduction of Mouton Cadet to American wine lovers, the aim still remains the same: making the richness of the prestigious Bordeaux terroir accessible to a wider audience, offering both authenticity and quality with the Rothschild name as the hallmark of French savoir-faire. This reinvigoration of Mouton Cadet is reflected in the priority given to full control of supply and rigorous parcel management, a development unique to a Bordeaux brand that will allow the portfolio wines to get the best out of each terroir. At the same time, close collaboration with the 453 partner-winegrowers along with Mouton Cadet’s winemakers ensure the care and meticulous selection of only the best grapes for all future vintages. These initiatives, coupled with Philippe Sereys de Rothschild’s vision for the next chapter of Mouton Cadet, have helped to refine the wine’s signature style, making it even more smooth and round while remaining true to its origins, as elegant and refined as ever. The portfolio will be featuring both red, white and rosé wine – underlining the skills of the Mouton Cadet winemakers in the art of blending, capturing the perfect balance between fruit and freshness on one side and elegance and structure on the other. To accompany the new taste, Mouton Cadet has also unveiled a new look for its bottles, redesigned for the relaunch while staying true to its heritage. Since Mouton Cadet’s creation in 1930 by Philippe Sereys de Rothschild’s grandfather, it was launched in the U.S. in the 1950s with tremendous success and spoke to the family’s commitment to make the previously austere and exclusive Bordeaux wine accessible to a larger public. His mother, Baroness Philippine de Rothschild, developed its global visibility throughout the 80s and 90s. After moving into the role of Chairman and CEO, Philippe Sereys de Rothschild is now poised to continue the family’s visionary spirit and quest for excellence, and is tasked with the relaunch more than sixty years later to celebrate this heritage. 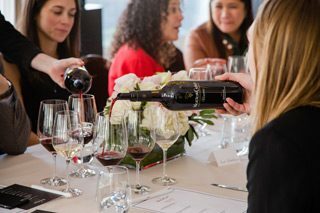 True to its convictions, the new generation of the family is focusing its energy on reviving the Mouton Cadet brand across the world, with its latest unveiling in the U.S., seen as a key market for growth on an international scale. The portfolio of wines under the Mouton Cadet brand will be imported and distributed by Shaw Ross International Importers.